The Cheyenne gunbelt is a moneybelt style gun belt with holster. 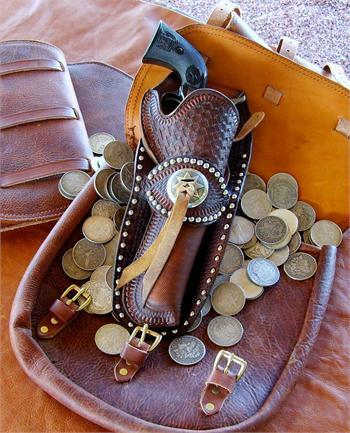 The holster has an eight-sided star slotted concho with bleed knot, spots and border tooling, is available in straight left and straight right and has a hammer thong. The gun belt is a classic old west style money belt with a fancy buckle. The money gunbelt is made from one piece of leather folded over and sewn along the seam to creat a pocket that you can put valuables into. Available in Black, Brown and Natural. The money belt style gunbelt was popular in the old west for carrying important documents and money. This fully functional style gave the wearer a gunbelt with bullet loops but still allowed him to conceal his valuables while readily having their gun close at hand. 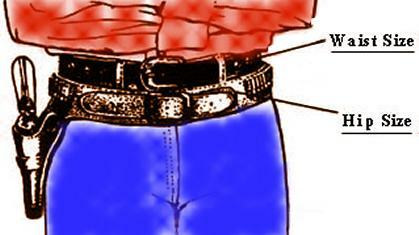 To obtain the correct measurement for your gunbelt measure around you hips approximately 2 inches below your pants belt. We have to have the correct measurement as shown in the diagram for your belt to fit. IF YOU HAVE ANY QUESTIONS PLEASE CALL. Gun holster with eight-sided star slotted concho with bleed knot, spots and border tooling. Available in straight left or straight right.